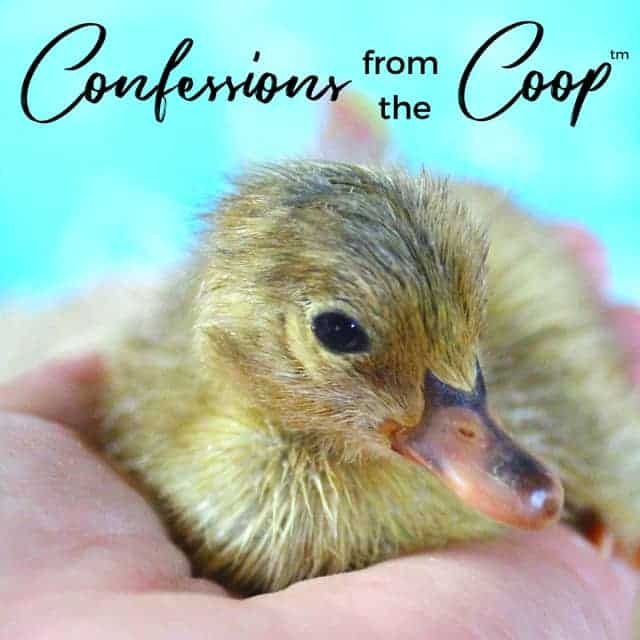 You are here: Home / Our Animals / Chickens / Confessions From The Coop (TM): Ducklings! This month so far has been a notable one – we have ducklings! Yep, we’ve been testing out a Brinsea incubator (read the review here) and we now have 10 beautiful ducklings of all shades! A couple were “shrink wrapped” (the humidity fell below 50% so we were keeping an eye on them) but hatched successfully with help, and one egg I’d marked as “likely a dud, but let’s wait and see” hatched a beautiful fawn-colored duckling. Now it’s time for these guys and gals (hopefully some are female!) to grow up! This time of year in Southern Missouri is perfect for hatching young poultry – it’s VERY hot outside, so we don’t need a heat lamp. During the first week of life and then at night until they’re fully feathered, they stay in the cabin to make sure they’re warm enough. And I’m pretty sure this flock of ducklings is related to jumping beans, because even though they’re in a brooder (we use kiddie pools, which work GREAT….normally), they kept escaping. The first week of life, I tucked them into their brooder at night, but every morning, I found them wandering around the cabin! We have crates around their brooder to prevent escape, but it seems I have some sort of Houdini ducklings. It’s great to know they’re so healthy, but I wish they would stay put. We’ve now transferred them to the large rabbit crate I use as a tractor for very young poultry, so at least they now can go outside AND stay safe! Once fully feathered, we then have the task of building them a super secure coop! These ducklings and baby chicks are trying their hardest to grow up, which means all sorts of new experiences…..like escaping their brooder non-stop. And running around the cabin….far away from their feeders and waterers. The ducklings have already taken to water – we haven’t given them their first swimming pool swim, but they’ve been playing in their waterer non-stop. I can’t wait to introduce them to swimming – it’s still a bit hard to believe we now have 15 ducks (and we’ll have more – I want to do one more hatch before fall sets in). At any rate, they’re happy and growing up and always ready for some fun!